Need some time to relax? Spend sometime outdoors? Get some fresh air? Come on out for a trail ride!! Appointment only, no drive up rides! 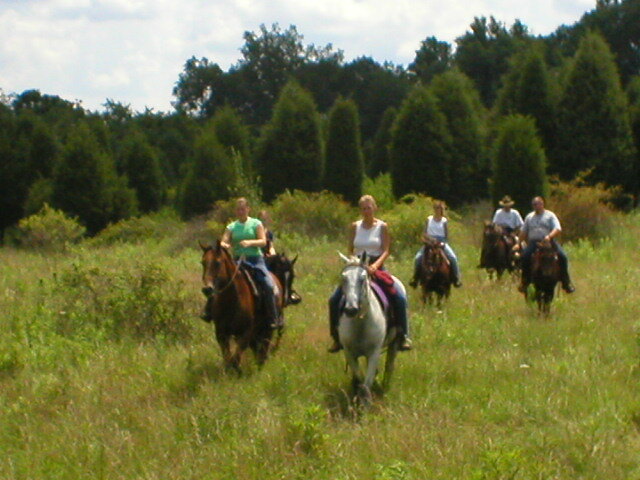 We have a herd of great trail riding horses for every level of riding. Our trail rides are a little different than most Riding Barns, not the boring head to tail rides!! We have a wide variety of saddles to choose from to make your ride comfortable! You will also have an opportunity to brush the horses before you get to ride! Personalize attention to every rider to insure a safe ride. We'll take you on a ride where you are free to ride at a comfortable pace on a safe horse. You will have an opportunity to trot, if you wish! Please be sure to read the "Questions" page. It will answer a lot of questions most people have! Rides can be scheduled just about anytime. We just ask for a few days notice if possible. Prices vary depending on the length of the ride you wish to take. Give us a call for more information! You'll be amazed how much fun you can have on a horse! We look forward to seeing you out here! We have some great horses, but also safety is an issue. Pairing the correct horse with the experience level of the rider is important! Also, we only do 1 or 2 rides a day. Your horse experience is personalized and we take our time! Please understand, if you have scheduled a 1 or 2 hour ride, you will be riding for 1or 2 hours, but to get saddled up, signed in, and out on the trail can take up to an hour. What I mean is, if you are in a rush, let us know. Because we are not! Plan on spending 2 or 3 hours here at the least. Life is to short not to spend time with a stranger and get to know them! ****If you make an appointment and something comes up, please call us as soon as possible. Most of our day is planned around your ride times. So, out of courtesy, please call if you are running late. If a ride has to be canceled, please give us enough notice so we can make other plans. We work outdoors most of the day. Please call, leave a message we'll call back ASAP. Emails are great, but to get a faster reply please call! So, why not take a few days off, and plan a trip. We are located just outside of Madison, Indiana a small river front town. Lots of antique shops, bed & breakfasts, Lanier Mansion & other historic homes, local wineries, and Clifty Falls State Park. For such a small town it's a great place to take a few days and explore and relax! Clifty Falls has camping, hiking, a hotel, and lots of picnic areas. There is even Versailles State Park too!